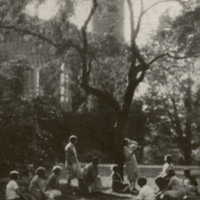 Photograph of students, most of whom are seated on the lawn, reading poetry. Image from the collection of Rae Millman, student at the Bryn Mawr Summer School for Women Workers in Industry ca. 1925. Typewritten poem by Rae Millman. 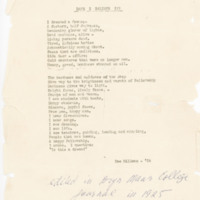 Inscribed below poem: "edited in Bryn Mawr College Journal in 1925 under my maiden name".